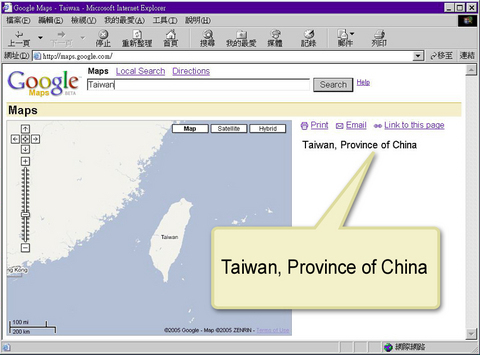 An October 20, 2005 Associated Press news article entitled “Google maps divide China, Taiwan” commits a universal but nevertheless unacceptable error. AP: Google Inc.’s popular online mapping service has become entangled in a long-running territorial dispute between China and Taiwan. Until recently, Google’s maps described Taiwan as a province of China. Comment: So far, so good. This is in fact what happened. AP: That sparked protests from Taiwan’s government, which has considered its island an independent state since ending a civil war with China more than a half-century ago. Shortly after Taiwan’s foreign ministry formally complained, the China reference abruptly disappeared from Google’s Taiwan map last week. Comment: No, no, no! Wrong, wrong, wrong! First, the protests were not from “Taiwan’s” government. They were from the Republic of China government. More precisely, they were from the unelected Chen Shui-bian regime, which was deposed by ROC voters during in the 2004 presidential election, but which with the help of the US government is illegally squatting in the ROC Presidential Palace. Secondly, the illegal Chen regime would have the world believe that “Taiwan” is an independent state, but they themselves know perfectly well it isn’t. Thirdly, the Chinese Civil War that the Associated Press refers to is not over. Not officially, anyway. The two sides stopped fighting, but no peace treaty, no cease fire agreement was ever signed. Even Lee Teng-hui, the self-styled “Moses” of the Taiwan independence movement, has openly conceded that legally speaking, the Chinese Civil War has never ended. Technically, the Chinese Civil War is more of a hot war than the Korean War. That change has provoked cries of dismay in China and talk of a possible boycott of Google’s service in that country, according to Chinese media. The change doesn’t reflect Google’s political opinion on the dispute, according to company spokeswoman Debbie Frost. She said Google wanted to enlarge its map images to make them even easier for users to see, so it removed all text from the left corner of the Web page. The long-planned switch also has removed the descriptive phrases that appeared alongside other countries on Google’ss maps. Although initially disappointed with the change, the Chinese government now understands it’s part of a product upgrade after discussing the issue with Google, a spokesman for China’s San Francisco consulate said Wednesday. “We continue to think it’s important to recognize Taiwan is part of China,” Qiang Wang said. In other words, Google may have removed the remark referring to Taiwan as “a province of China,” but at the same time it has not substituted a remark referring to Taiwan as “a sovereign and independent state,” as the Chen regime wanted. Google continues as company policy to recognize Taiwan as part of China, as it should based on hard facts, making the Taiwan independence nomenklatura’s “victory” pretty damned hollow. Meanwhile, Taiwan independence zealots can comfort themselves by assuming their usual “Ah Q” attitude and acting as if they have won a genuine victory.